X-Plane 10 does look interesting and some good concepts.... but it is a pity that the demo is only 10 mins and you can't fly it. It does look good and very promising (though not happy with the sound), but it will need the addon treatment to make it as good as FSX. Given my investment in FSX it really isn't a viable option to make the transition. well there is up sides and down sides of every simulator, the following is based on x-plane 9 + the short demo 10, well the good things in x-plane is the stability compared whit FSX. X-plane can get to a critical stage where you think now i get oom error as the sim might stop but in a sec the sim run again mainly whit high settings... and yes it can easy be set so the sim dosent work proberly if you want to run whit all details at highest level to show roads ect. Its basicly a balance of visual and simulation the visual in some way might seem better in FSX and the other way around. But the next good thing in X-plane is the aerodynamic it seems to me more realistic then FSX when i compaire it whit the ATR simulator + real flight in a samall plane, and on jumpseat in some real flights. The down side is the default airports in X-plane isent as good as FSX when i look at X-plane 9 my best ex is EKRN where the appron in x-plane is grass whit taxi signes. + ESSA i mean som trees on the taxi way. so in some way so far it looks like FSX have visualy good stuff and X-plane have the aerodynamic and start to give us better visuals improvements of the expirence. so when it all comes to the end it might be a qustion of good visual of airports and so or you would like the real aerodynamic + the improvements´of the visual and new stuff. And yes i also mean the weather looks grate i X-plane especialy when flyeing through the clouds ect..
X-plane have to run on a extremly good PC to run at max settings to give the max experince, but if you can live whit lower visual to get it run smooth and enjoy the flight expirence X-plane is a number 1 in my eys.. also look on the simulator the airlines educate there pilots in like the ATR or elite simulators i tryeid its not the visual experince its the simulation also why elite is able to run on 1 pc only. Other places you normaly have to set PC´s in lines to process given data like pc1 for aerodynamic 1 pc for traffic another or 2pc´s for the gruond textures.. ect like marlev as i seen a dvd whit there sim based on FS9 they run 8 pc in line to get it as smoth as posible.. so it might be dam hard to give both visual and the plane exprience on 1 pc.. just to give the perspective..
hit shift-0 to get a virtual cockpit in the 747 and use arrows and mouse to roam about the airplane... do NOT go into the bathroom halfway back on the left! occupied! in the special menu, turn on the various 'show flight model' options... they run fast now... try this in some turbulence! try the various updated airplanes, like the shuttle, b52, x-15, f-4. f-22, etc -go to the aircraft and situations window to try various options, including carrying the shuttle! Downloaded this last night, used the torrent option, about 30mins as opposed to the 12 hour direct download option. Not tried X Plane before so naturally curious. Before i say any more, here are my computer specs, very average, dual core running at 3.16, 4GB ram, GeForce GT 240 card and running on XP. Firstly, framerates. On the standard planes in the game, nothing under 30fps. Much smoother than FSX at least for me. Controls are obviously different, tried to use the flaps and ended up turning my engine off on take off but that's to be expected. The clouds look amazing and the weather generator is easy to use, or simply download the real weather from the net. The night lighting is something else, not tried the dynamic lighting yet but will get round to that later. Roads and vehicles look great although detail near airports is lacking as it is ONLY A DEMO after all. Standard countryside scenery is average at best, trees very FS9 on the settings i've been using so will try higher detail. Flight model while more twitchy compared to FS9/FSX seems to be more realistic based on other users feedback and general information available about the simulation. If anyone knows how to change the onboard temperature gauges from fahrenheit to centigrade, i would like to know as i have no knowledge of fahrenheit at all. Based on the fact it's a demo, it's clear it's a quality sim and if the rumours are true that M$ are closing out aftermarket developers in regard to Flight, then it's clear X-Plane will be the way to go in the future. Just for kicks, this is the front of the box we will release as soon as possible. Everything that's white will be transparent and as this will be a metal (!) box it will have very nice metal accents. Is the the version you'll be selling won't be PC/MAC ? Don't tell me we'll have to buy 2 software if we have both a PC and a MAC at home ??? I asked a few days ago, and Mathijs said it was both. But that box art sure looks PC-only...? Hi. Latest update on my purchasing saga. Finally ordered after the buying process hung yet again, this time on my birthday which it claimed was incorrect (think i know when i was born). Finally got through to actually paying for it after numerous failed attempts, asked that the product be sent to a different address other than the invoice address. Filled out the details, get a confirmation email that it has all gone through. It then says the shipping address is the same as the invoice address!! I sincerely hope not or i will cancel the order. What is going on here? Never had this issue with download products before, but it's clearly a different system for boxed versions, one that isn't working as it should be. Why because it has PC on it? Mac are also Personal Computers! Hi. Latest update on my purchasing saga. Finally ordered after the buying process hung yet again, this time on my birthday which it claimed was incorrect (think i know when i was born). Finally got through to to actually paying for it, asked that the product be sent to a different address other than the invoice address. Filled out the details, get a confirmation email that it has all gone through. It then says the shipping address is the same as the invoice address!! I sincerely hope not or i will cancel the order. What is going on here? I am having this checked out, don't worry. X-Plane copy protection is handled just by checking the presence of DVD-1 in the drive at starting X-Plane. So you only need to move the DVD between PC's each time you start up the game simulation . ah no that's boring... I have having to put a CD in the drive and use it for nothing .... it seems from another age.. Can we make a backup copy of the DVD so I won't have to change from one drive to another ? We just checked the system and done a few test orders. But we have no explanation on what happens. What you describe we can only recreate by not entering some data. Only when the birth date is not entered for example will it state that the date is wrong. So I assume that just something has gone wrong with the form. We have cancelled your order as there was only one address. Since your order we had dozens of other orders without problems, so I suggest you just insert a new order in the system. Ok. Well i've had no email regarding the cancellation of the order, no mention of a refund, just your word, sorry but i want confirmation please. As far as i'm concerned you still have my money. Secondly, why did you cancel the order in the first place? Why not simply ask me for a delivery address via email? It's taken me two days just to order the thing, now you're asking me to go through all that again? Don't worry, Goulash. My word on it, we'll sort it out. Okay? An X-Plane 10 update is out. Will you make an AES for it and do you have already other airport/scenery in developement ? will you make also compatible your AirbusX ? Aerosoft announces new Flight Simulator! Paderborn, 30th Nov. 2011 – The Flight Simulation community has patiently been waiting for a new Flight Simulator after Microsoft declared the end of an era for its own Microsoft Flight Simulator. It´s now time for Aerosoft to announce a new Flight Simulator generation with X-Plane 10, ready to be shipped at the end of January. The new Flight Simulator carries more than 20 years of development time and counts on co-operations with flight schools and the aviation industry. The completely new graphics make PC flying a much more realistic adventure. A sophisticated AutoGen creates breathtaking landscapes, the lighting system supports hundreds of light sources and a new weather generator are only a few of the simulators capabilities. The Simulator also takes advantage of multi-core PC´s eliminating stuttering effects and supporting an optimized performance. The flight physics are absolutely unique as the flight dynamics are calculated in real time directly from the 3D model taking its real physics into account. This is why X-Plane comes with the most accurate flight model available for PC flying. 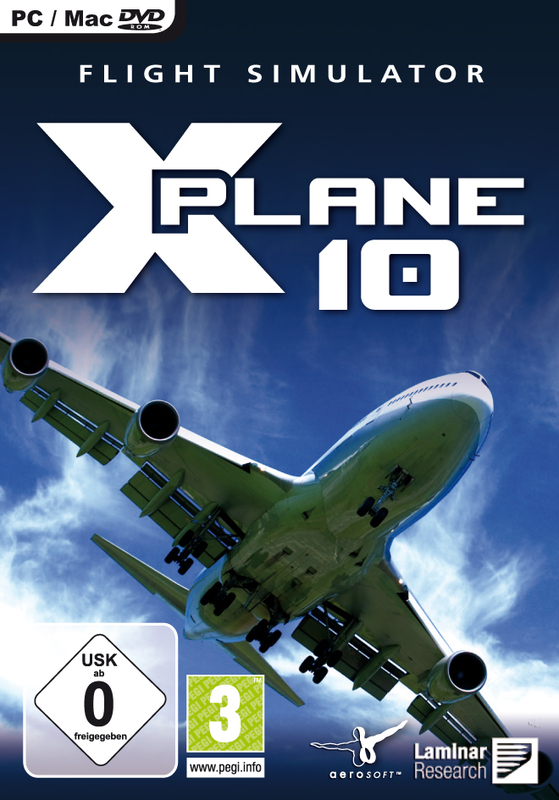 X-Plane 10 is based on a completely new graphics engine for the platforms Windows, Mac and Linux. More than 81 GB of data make it one of the most comprehensive simulation games ever. Paderborn-Lippstadt and Faro will be extremely detailed whereas airports such as Frankfurt, London, Paris and Zurich and others will receive a make up to a high detailed standard with customized buildings. Development of X-Plane 10 has been done in South Carolina (USA) by Laminar Research. With the release of the simulator the PC pilot can already choose between hundreds of freeware add-ons. In addition Aerosoft will soon make their well known add-ons for the Microsoft Flight Simulator available for use in X-Plane 10. Well, we adapted the box design already so I think the issue is solved. I think it was a smart move to add the Mac label, just to avoid a lot of confusions and uncertainties. When I bought version 8 a long time ago from a local vendor they didn't sell the DVDs with the Mac and Linux version on it, like Laminar always do. I just assumed they would, so it's good idea to be clear about these things! I've been testing the demo and I'm loving it. Can't wait to get the european version with the detailed airports. Any chance of a tiny preview in the near future?